Monika Vykoukal: Yes, and I have brought Eva Merz with me. My name is Monika and I am the curator of Peacock Visual Arts in Aberdeen. I have been initiating, supporting and documenting for Peacock a series of three six-month artists residencies in the former social inclusion partnership areas of Aberdeen, which we are now focusing in the area of Tillydrone. This photo was taken in Tillydrone. I will explain what it is about. The project was funded by the Scottish Arts Council and Aberdeen City Council. The partnership part of the residency consists in us working together with Station House Media Unit which is a community media organisation in the former social inclusion partnership areas. Eva Merz’s residency went on from November 2006 to June 2007. The idea behind the residency series is to investigate common issues in the area together with local people. So the public is first of all defined geographically by the funding criteria. The artist lives and works in the area in a social housing flat and becomes a resident for the period of the residency. Eva’s work was very much about developing a personal relationship with her neighbours and people she met in the street as she went to the hairdresser and to the local shops and so on, and inviting people back home for coffee and for a chat, and to gradually gain an awareness of the area at the beginning of our project and getting to know people. The first public work in this was – this is one photo of many. Eva was walking about the area and noticed 72 signs in this very small part of town. All the signs were put up by the City Council in the last 20 years. They say things like, ‘No Ball Games’ ‘No Exercising Pets’, ‘No Golf Practice’. The amount of them was quite staggering. On Valentine’s Day last year she covered them with red vinyl hearts which was countering the type of public space that was created by the City Council which was all about really disciplining people basically. Eva was putting other alternative messages which were quite provocative. So it was also getting a reaction from the people in the area and making them aware that the signs have been there in the first place. The second manifestation of the project was, she had been meeting people all along and decided to make a book with interviews of eight women in the area – people from very different perspectives. There was a woman who was doing an MA in Design at Gray’s School of Art who lived in the area; there was a person who was a drug dealer, so it was touching on other aspects of life. They were all asked how they felt about the area. Eva’s work was a lot about getting people’s opinions across and helping them to speak for themselves as visibly as possible. 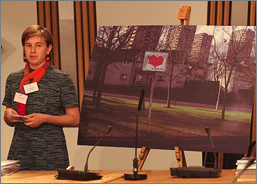 She had also met a little girl while doing those love hearts, Bobby. Bobby wanted to paint all of the signs pink, and they did that as well. The last activity that happened in the residency was that there was a Book Launch Barbecue Party in the area, with the books being free to all the residents, and local people making music and so on. From our perspective, we have got two more residencies in this scheme and I hope that we can go on to work on this one area and focus on it. We are getting already a lot of feedback from people who were involved about what they would like to see happening next – so, ideally, they would be able to have a say in what kind of art they would want to see. Eva is going to read from the book. Getting people involved is the hard part. It is really hard. I think people need to have a bit more belief, and the need to strive for it, because we are nae gonna get it without a fight. Councillors don’t live here. If we want change, it needs to come fae us. We need to say, ‘Okay, you have promised us this. We want it!’ Ken? It’s different than saying, ‘Okay, you’ve promised us this, but we are nae gonna get it.’ No, we want this! We want a better place to live. It takes a united and stronger voice. We need mair folk. Get involved! Come to the meetings! It will be worth it in the end. And we will have a community we can be proud of. In the future, when people ask where you stay you can say, TILLYDRONE – the best community in Aberdeen! Oh – can I just say one thing. If anybody is really interested in copies of Tillydrone – feel free.